Las Terrenas is a town in the Samaná province of the Dominican Republic. It is internationally renowned for its high rate of tourism, its white sandy beaches and pristine waters. A large number of its frequent visitors are Spanish, Italian, French and German, and it’s from this picturesque town where Sand Dollars (Original Spanish title: Dólares de Arena) stems to portray a world full of contradictions. Contradictions that go from parties and vacations, to love, betrayal, pleasure, morality and loneliness. Freely adapted from Jean-Noël Pancrazi’s novel “Les Dollars des sables”, Sand Dollars is a Dominican-Argentine-Mexican production and a microcosm of the Dominican Republic. The directors, Laura Amelia Guzmán and Israel Cárdenas manage to perfectly portray significant contrasts: the young and old, the rich and poor; the foreigners want to stay and the locals want to leave. The film also uses certain elements that contribute to the overall tone of the movie, and the impossible relationship between Anne – played by Geraldine Chaplin, and Noelí – played by Yanet Mojica, who is a salsa dancer at a disco in Las Terrenas, making her film début. Noelí is a young woman who prostitutes herself but is not very conscious of it. She dreams about leaving the Dominican Republic and making a new life in France in order to give herself a better future. Anne is a wealthy, French, older woman, who is living in Las Terrenas, and whose focus is primarily pleasure, rest, and oblivion. Throughout most of the film you witness how Anne remedies herself by paying for companionship, to playing the role of a tourist, but it’s her desire of belonging to a place that is not her own that made me reflect about my own personal struggles that stem from getting used to a new city, a new life, and the aspiration to go after a distant illusion. Sand Dollars is not just only a film about getting older or being foolishly young, but about sweetened dreams and the bitterness of reality. It portrays how people who live in third-world countries can go above their circumstances and rise to give us a song, a dance, and a smile. 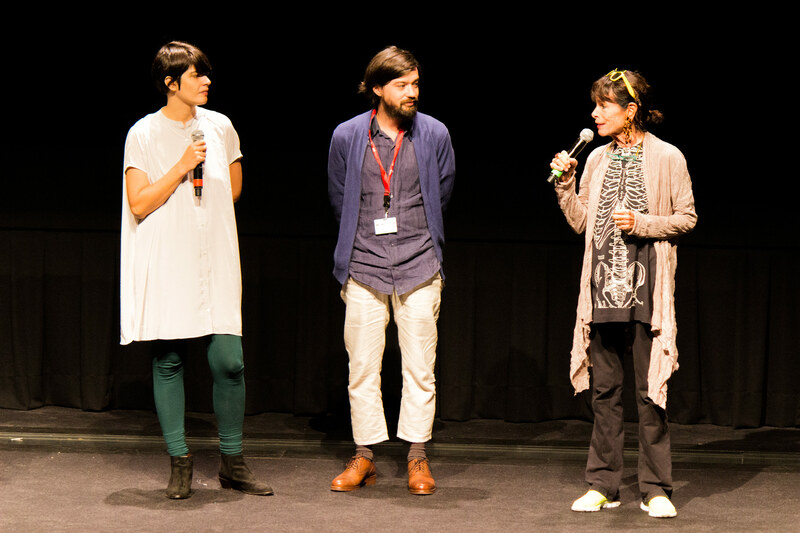 Leading actress Geraldine Chaplin and directors Israel Cárdenas and Laura Amelia Guzmán.